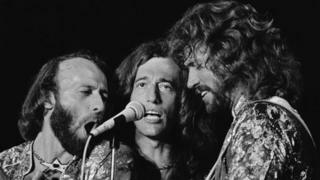 The Bee Gees, whose founder Robin Gibb has died, had hits spanning five decades in genres from disco to country. Here, two songwriters explain why they were among the greatest ever songwriting teams. "You can easily speak about them in the same breath as Lennon and McCartney and Elton John and Bernie Taupin," according to award-winning lyricist Sir Tim Rice. The Bee Gees were on a par with The Beatles when it came to songwriting, he believes, adding that the band wrote songs that would be around forever. Sir Tim, who presented Robin, Barry and Maurice Gibb with a lifetime achievement honour at the Brit Awards in 1997, said the trio's place in the songwriting pantheon was "almost as high as you can get". He told BBC News: "It took a bit of time for some of the more so-called intellectual end of the music business to realise this, but the public realised it almost from the word go." Much of the group's appeal came down to Gibb's voice in the early days, Sir Tim believes. "He had this extraordinary soulful voice, which was very unusual - especially from a boy still in his teens - on records like Massachusetts and I Started A Joke," he says. "But they also had two other singers in Barry and Maurice, with Barry taking over a lot of the lead vocals in the disco era. Whatever style they presented their music in, it was always original. "They were fantastic performers and singers but of course why they will last forever is the songs. They had jolly good melodies and very original lyrics and they were songs an awful lot of people could identify with." Sir Tim, who has won numerous awards, including an Oscar, Grammy, Golden Globe and Tony, during an illustrious career, also praised the longevity of the band. "In a way, unusually for most pop singers, they actually got better as they went on," he says. "Islands In The Stream and I Am A Woman In Love and all these other songs were quite late in their career." Jive Talkin', which gave them success in 1975 after three years out of the charts, was a pivotal release for them, Sir Tim explains. "Jive Talkin' was the record that got them back in a big way when they'd been out of favour," he says. "That one is quite overlooked - it was a huge hit, but the thing about it was that it really ushered in a new rhythm and it was a key record for the whole disco movement. "They just got those rhythms going really early on and coupled them with fantastic melodies." The trio's songwriting has influenced generations of artists, Sir Tim says. "Their influences are such that a lot of people from The Fugees to Take That, from blatant pop acts like Steps to quite sophisticated acts today, are covering their songs. "And of course, people who have done their songs over the years include legendary artists like Al Green, Elvis, Nina Simone and Barbra Streisand. These are Division One artists." Gary Osborne, songwriter and chairman of the Ivor Novello songwriting awards, suggests that if it had not been for the Beatles, the Bee Gees would have been recognised as the best writers of all time. "The Beatles were in a different league, then there was the Gibbs, then there was everyone else," says Osborne, who has written tunes for Sir Elton John, Jeff Wayne and Kiki Dee. "I don't even think [Mick] Jagger and [Keith] Richards could quibble with that, just in terms of the quality of the actual songs. "In the dance era, the groove was very important, but the Bee Gees weren't about the groove. They were about the song, whereas the Rolling Stones are about the feel of the riffs. "We love the vibe and the synth on Jive Talkin' and all those things, but when you strip them down to a guitar they would have worked in any era. They were just classy writers. "They won 29 Ivor Novello Awards between them in pretty much every category we've got, culminating in the Academy Fellowship in 2005. And in songwriting terms that pretty much says it all. "They just wrote brilliant tunes. It's not a mystery but it's magic."